Explain about the Bulimia Nervosa? Bulimia Nervosa, as you may recall studying earlier, is a disorder characterized by episodes of binge eating or very rapid intake of large amounts of high calorie food accompanied by self-induced vomiting. Use of laxatives and diuretics is also practiced to lose weight. Patients fear that they will start gaining weight if they stop purging. It occurs in those who want to eat more but at the same time want to remain thin. So, what is typical or characteristic feature of bulimia nervosa patient? It is a recurring episode of binge eating followed by one or more inappropriate behaviour to prevent weight gain. These behaviours may include self-induced vomiting, laxative abuse, diuretic abuse, excessive fasting or compulsive exercise. The combination of heightened anxiety, low self-esteem, over concern about body shape, physical discomfort and intense guilt provokes the drive to purge the food by self-induced vomiting, excessive exercise or the misuse of laxatives or diuretics mentioned above. 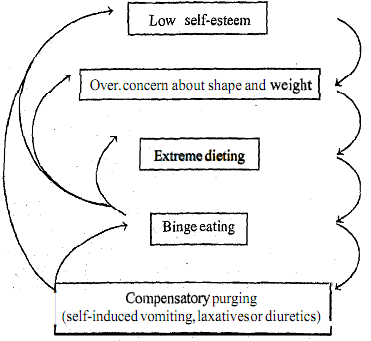 Figure illustrates the vicious cycle that maintain binge eating. This perspective on the perpetuation of bulimia nervosa is a cognitive one. How do pathological conditions affect homeostasis of your body?